ELSPEC G4500 BLACKBOX Portable Power Quality Analyzer. Power Quality in High Definition. Built on the same innovative technology as the BLACKBOX fixed Power Quality Meter (PQA), the ELSPEC G4500 BLACKBOX Portable Digital Power Meter, with its continuous onboard waveform logging, is the most advanced Voltage recorder on the market. The G4500 BLACKBOX has the power to determine the root cause of all Power Quality (PQ) issues, so plug it in and never miss another event. The wireless BLACKBOX Portable Digital Power Meter, coined POWER QUALITY (PQ) IN HIGH DEFINITION, logs and stores all information all the time for more than a year at high accuracy, allowing no gaps in data recording. With a built-in 802.11b/g access point and built-in Ethernet router, the BLACKBOX Portable Power Quality Meter allows remote analysis from anywhere. No Thresholds/ No Missed Events: Continuous 1+ year logging of all network parameters. Captures Everything: Cycle by Cycle RMS values, frequency, harmonics, and trends. Sampling Rate: Voltage up to 1024 Samples per cycle. Current up to 256 Samples per Cycle. Quickly Retrieve Data: Built-in Web server for remote monitoring using a standard Web browser. 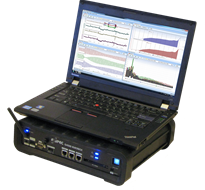 The Elspec G4500 Blackbox Portable Power Quality Analyzer is tailored for PQ Analysis at any location. It features a quick and simple set up, remote connectivity with no missed events. Equipped with a plug and play probe interface, the portable G4500 BLACKBOX allows you to automatically detect probes &amp;amp; clamps during set up. For surpassing the highest standards set by the industry it complies with the standards for aggregations, time clock uncertainty, flagging and transient influence quantities. It comes with 4 automatically detected&nbsp; AC current clamps and 4 (G3500)/5(G4500) Voltage leads, rechargeable power supply, wireless network, a durable carrying case and a mobile analysis lab.